Press Pass LA was back on the red carpet of “The Voice,” after watching the contestants completely blow audiences away with their dazzling and emotional performances. This week seemed different for contestants, not only did they have their mothers with them for Mother’s Day, but it seemed as though the pressure of the semi-finals is finally hitting them! America and celebrities alike, have praised many of this season’s contestants for their extraordinary creativity and talent. In fact, Lauren Duski from Team Blake got a personal phone call she was not expecting this week, from none other than Wynonna Judd! “I didn’t know she was calling, they just had me sit down and said, ‘Hey we are gonna run the camera’ and I was like, ‘Ok what do you guys got up your sleeve?’ Then they gave me the phone and Wynonna said, ‘Is this Lauren?’ I was like, ‘Stop!’ I knew immediately when the accent came through. She was so kind, just inspiring. I don’t know. It was crazy, she gave me the best advice. She said during one of her shows opening for Tammy Wynette, she said ‘Tammy told me, ‘There is only 1 Tammy, you just be Wynonna, ya know, and don’t try to be anything else.’’ She told me to do the same, even though I was covering her song. It’s pretty cool to hear that from her. I am just honored she took the time to talk to me,” said Duski. Another contestant on Team Blake that is getting a lot of love from the fans is TSoul, whose fans have created their own movement called “TSoldiers.” “TSoldiers, it’s crazy! It kind of blew my mind. Carson Daily said that way back in my blind audition, and now Blake has said it has just caught on to everybody now. There are TSoldiers all over the world. It’s amazing,” said TSoul. For one contestant, last night’s performance was the most emotional yet. Team Blake’s fifteen year old Aliyah Moulden sang “Jealous” by Labrinth and dedicated it to her late father whom she never really got to know. By the end of the song, she was in tears and so were millions of Americans watching. It was a truly moving performance and it was an amazing experience to watch live. While speaking with Moulden, you could tell the performance emotionally drained her but that she was happy that she did it. “There was lot of stuff going on in my head and it was just a lot…but I’m doing better now, I just needed a moment. It’s very hard to express how you feel in front of millions of people. Throughout the whole performance I was just like, ‘Don’t think about it too much, don’t think about it too much,’ but at the end, it was all I could think about.I think I made my dad proud. I think he would have liked that performance, and I’m just really grateful I got to show that other side of me,” said Moulden. Team Adam had some standout moments last night as well, specifically Lilli Passero, who made a risky yet fortuitous choice with the classic “Unforgettable” by Nat King Cole. “I’ve known that song for as long as I can remember. When I was little, my aunt used to play it for me and when it would end I would say, ‘Again, again.’ She would just play it over and over again, and I started singing it as a little girl. I think there was just something about his voice and the song that spoke to me. That song is beautiful. I really was scared to sing it; I didn’t think I should. I don’t think anyone should, although there have been some really amazing covers. I actually loved Sia’s most recent cover of it that she did for Finding Dory. But it’s a classic that I hold very dear to my heart,” said Passero. 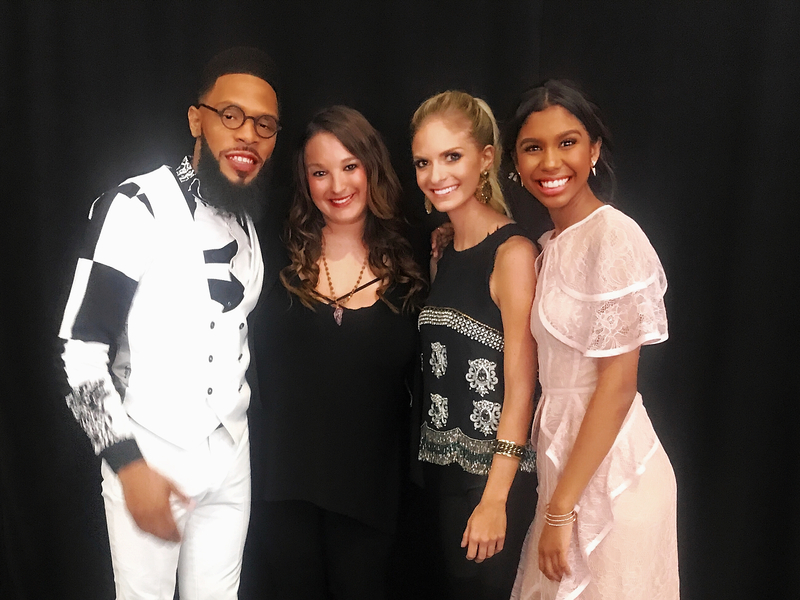 When speaking to Vanessa Ferguson and Chris Blue from Team Alicia, to say they were humbled by not only their performances last night, but from this experience as a whole, is an understatement. For Ferguson, her performance of Lauryn Hill’s “Doo Wop (That Thing)” was extra special (and risky) because Alicia reached out to Hill herself to get permission for Ferguson to sing the song. “That was pretty incredible. I definitely think it is super cool and I am really thankful that she pulled those strings cause she really wanted me to be able to showcase that I rap and that was really important to me too, so I am glad that she cared enough to pull some strings,” said Ferguson. Chris Blue also had a very special night performing Bruno Mars’ “24k Magic.” By the end of the song, audience members were on their feet dancing and the entire energy of the room was definitely changed for the better by his performance and contagious energy. “I prayed something has shifted, it was really fun. I loved this song and I said in the video package, it is a song that brings joy to me. All the other ones I was really in my head but for this one, it was really about just have fun and enjoy it. I tried to do that on stage tonight and I hope that translated on screen,” said Blue. Lastly, we got to speak to Hunter Plake from Team Gwen, who did a fantastic adaption of Steve Windwood’s “Higher Love” that totally blew people away. Adam even complemented him saying that he was very connected to the music, which was a huge complement for Plake. “It makes you feel really good, because that’s what I am, an artist. I’m doing covers right now, and I had never done covers before. I normally sing my original stuff, so coming into this place, I didn’t want it to become karaoke, because that’s not my goal. So far in my journey, I am changing up everything. I am able to show people who I am as an artist, honestly. I’m thinking about my journey when “The Voice” ends too. That’s in 2 weeks, which is crazy to think about. So in 2 weeks, even if I win, I am going to have to go into a direction as far as my artistry. So I want people to know who I am already, so when I am releasing stuff, they already know what’s coming,” said Plake. Tune into NBC tonight at 8pm CT to find out who will make it to the semi-finals!